Glasses have been the most common and widely used gemstone imitation. It has the capability of imitating almost every gem material ranging from transparent to opaque and in all possible colours. Emeralds, rubies, sapphires, diamonds, tourmalines, aquamarine, etc are only the few to name which are commonly imitated by glasses. However, identification of the glasses is not at all challenging as compared to few synthetic counterparts. 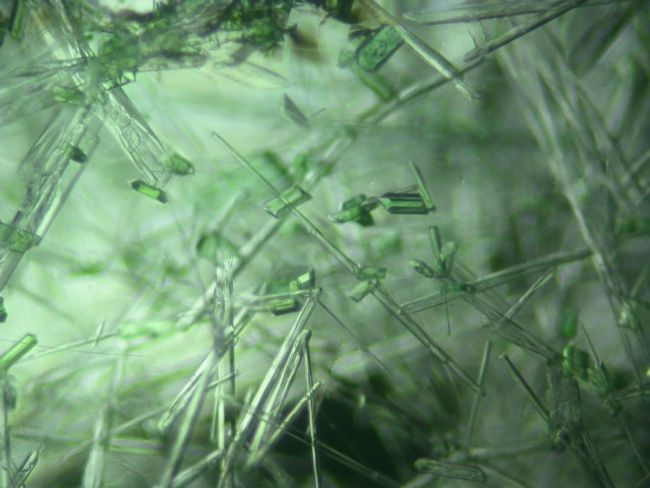 Most of the glasses can be identified by the presence of classic inclusions like gas bubbles (of various shapes), swirl marks, devitrification effects or crystallites. 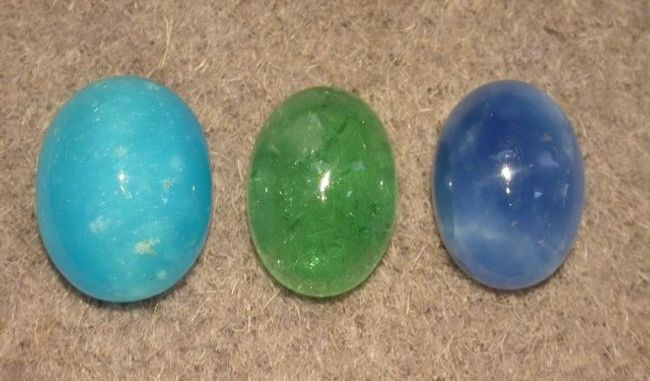 In the absence of these inclusions, identification can be made using optical and physical properties; glass is isotropic while most of the gemstones it imitates are anisotropic. Further refractive index and specific gravity aids in the identification. 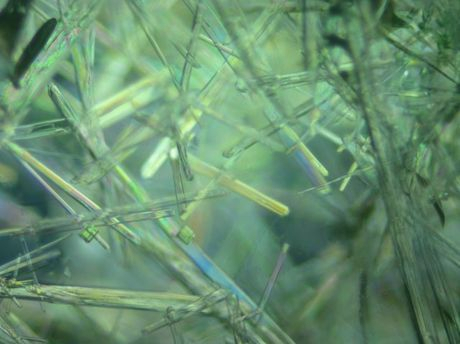 Figure 1: These translucent glasses were interesting as well as deceptive due to presence of acicular crystalline inclusions. However, in the mid of June this year, we received for identification few translucent blue and green specimens which turned out to be glasses (Figure 1). Visually, they imitated blue chalcedony and / or turquoise. 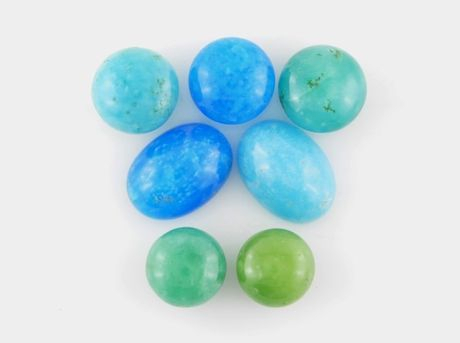 Glass imitation chalcedonies or turquoise have been known in the past as well, but these specimens were quite unusual because of their inclusion patterns; these consisted of transparent elongated ‘crystalline inclusions’. 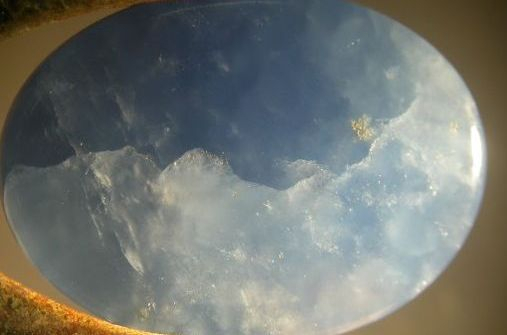 The depositor was concerned about the identification of these specimens as glasses because these are being sold as blue chalcedonies in the market. On discussion, it was found that these glasses are available in the market in large quantities and mainly comes from Taiwan. Mr. Rajesh Dhamani of National Facets, Jaipur was kind enough to share this piece of information and donating few pieces of rough and cut samples of these glasses for study purpose (Figure 2). 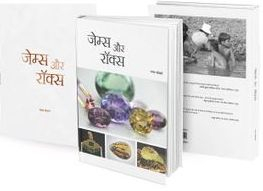 Following is the description of basic gemmological properties of these unusual glasses. Figure2: These cut (left) and rough (right) specimens of translucent glass were collected for this study. The studied rough and cut samples of these glasses were in the colour range of sky blue, grayish blue, greenish blue, greenish yellow and even parti-coloured blue and green (Figure 2). Most of the samples were translucent to opaque; however, few samples appeared semi transparent. 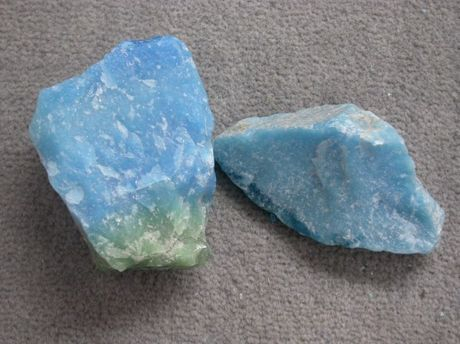 The rough samples displayed a granular surface, similar to many natural gem materials like chalcedony. Hence, when observed in its rough state, even the experienced eyes can misjudge these glasses as some natural material. The samples with low degree of transparency, also displayed weak sheen effect on turning them in various directions; this effect was however observed only in certain areas. 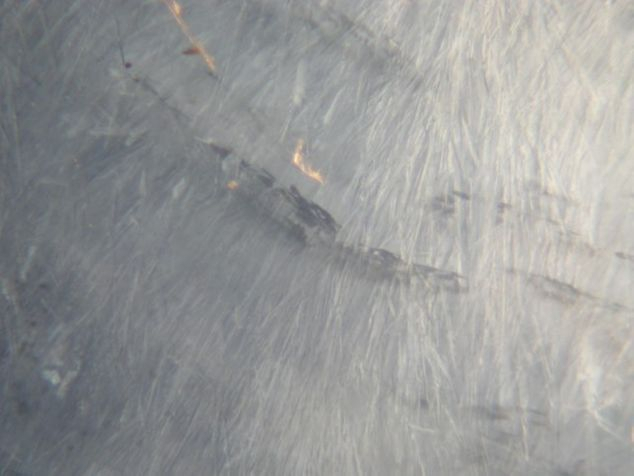 When illuminated with a fibre optic light, some of these displayed a whitish cloudy and patchy effect as seen in many natural gem materials of massive nature (Figure 3). Ultraviolet Fluorescence: Strong greenish yellow and blue under shortwave in blue samples; green or yellow green samples displayed a weak greenish glow. All samples were either inert or exhibited a weaker reaction under long wave. Visible spectrum: Deep blue sample displayed absorptions at the red corner and in the yellow region at around 580 nm. The yellow green sample also displayed similar patterns but was weaker while no absorptions were seen in other light blue samples. FTIR: Infra red spectra were collected for all samples, but no distinct features were observed for opaque to semi translucent samples. A distinct and conclusive pattern of graph was obtained in the thinner sections or samples which allowed the IR rays to easily transmit through them (Figure 4). Figure 4: Representative FTIR spectra of translucent glass (top) and relatively transparent glass (bottom). EDXRF: Qualitative elemental analyses revealed the presence of Si as expected for a glass. In addition, Ca, Fe and Cu were detected in blue samples while Cu was missing from the yellowish green. Further, the intensity of Cu peak decreased while that of Fe peak increased with the decreasing blue colour and increasing yellow / green colour. The most interesting and unusual features seen in these glasses were the inclusion features. These glasses contained numerous elongated transparent crystalline inclusions. Some of these were scattered while some were densely packed and gave an impression of devitrification effect commonly observed in glasses. Following are few inclusions which were observed in these glasses. 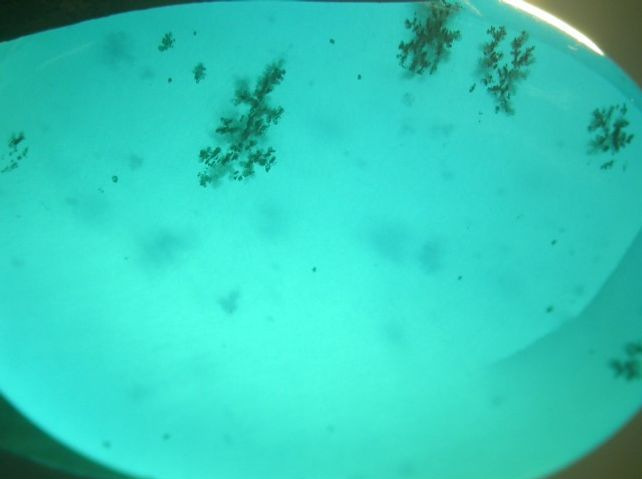 Figure 5.e: Few samples also displayed dendritic inclusions as seen in opals and chalcedonies. Similar types of glasses have also been reported by Hänni et al. (2001) (see, A glass imitation of blue chalcedony, The Journal of Gemmology, Vol. 27, No. 5, pp 275- 285) however, not frequently observed since then. As per the description / analyses by Hänni et al. 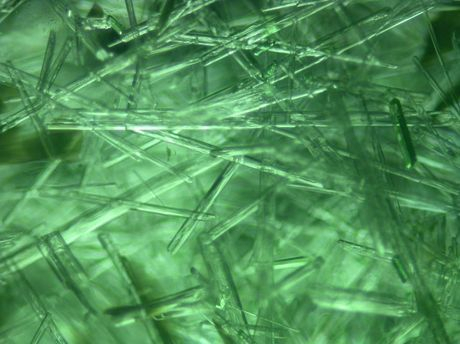 similar looking elongated transparent crystals mentioned here were identified as Wollastonite. One has to be cautious if such glasses with numerous crystalline inclusions are encountered, since they give the appearance of some natural mineral. Also care has to be taken while identifying these glasses as similar looking quartzes with numerous crystalline inclusions are also available in the trade. However, on the basis of gemmological properties, inclusion pattern, and spectroscopic analysis, the distinction between these glasses and quartz can be done.